Floods have claimed at least one life and displaced 10 families in Jhapa in the last two days. According to Nepal Red Cross Society, Jhapa, 42-year-old Rishidev Phago of Gauradaha Municipality-7 died after drowning in a flooded drain on Wednesday. Similarly, eight families have been displaced after the Kankai river spilled over its banks after heavy rains and entered a settlement at Gaurigunj Rural Municipality-2 on Thursday. The displaced families are taking shelter at Dargaha area. In Damak Municipality-7, the flooded Ratuwa river breached its embankment and inundated a squatter settlement on Thursday, displacing two families. Floodwaters from the rain-swollen rivers and rivulets have also damaged crops in several parts of the district. Nabin Baral, the ward chairman of Damak Municipality-3, said the rain-fed Mawa stream had swept away nearly one bigha of land at Dudhe on Wednesday and Thursday. The stream has changed its course and is headed towards a settlement. Around 50 homes are at high risk of flood, Baral said. 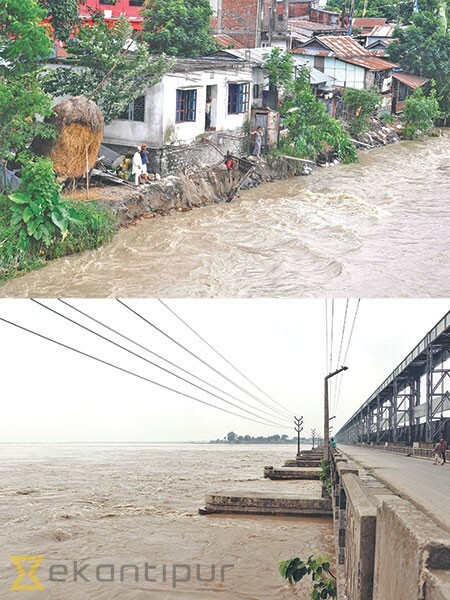 SUNSARI: The water level in the Saptakoshi river has crossed this year’s highest mark. Heavy rains of the last few days have increased the water level in the river, prompting the barrage operators to turn on the red warning light. The flow in the river was measured at 155,545 cusec at 4pm on Thursday. Twenty-four of the 56 sluice gates have been opened to lower the water level. Experts said the barrage, which was originally built to handle up to 950,000 cusec of water flow some six decades ago, can only hold half the capacity these days due rise in river bed.